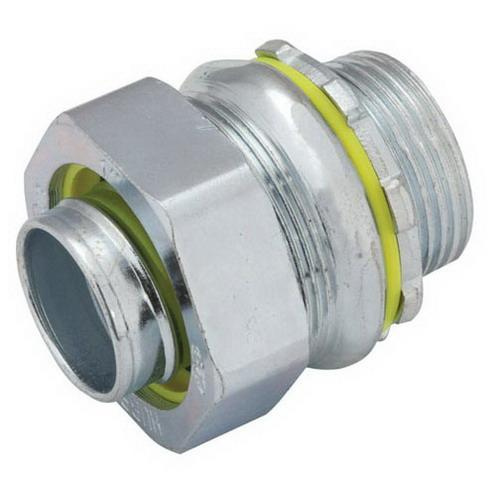 Raco Liquid-tight non-insulated straight connector of trade size 1/2-Inch, is suitable for use with flexible metallic/non-metallic liquid-tight type B conduit. Connector with 1/2-Inch thread length offers 1/2 - 14 NPT connection. Connector features malleable iron construction. It measures 1-3/16-Inch x 1-15/32-Inch. Patented split gland ring ensures tight seal and quick installation. It comes with sealing washer and heavy-duty lockout. Connector is UL listed and CSA certified.